Outside the Box: Take it Easy! 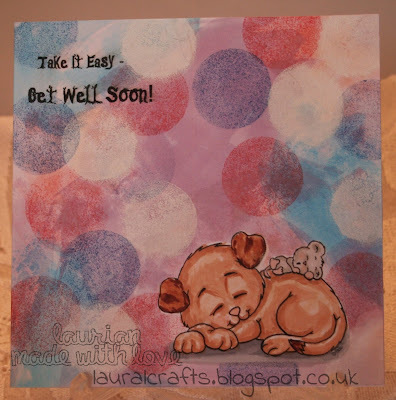 This is the latest digi from Gerda Steiner for the progressive challenge and I thought it was so cute and perfect for a get well card! I printed the image directly onto the card and coloured it up, I then masked it and added the background. I watched a tutorial by Jess from Gerda's design team about Bokeh and where as I didn't have the colours she had I improvised with some watercolour inks and the very few distress inks I have plus a pearly white ink pad. Well for a first attempt I think it turned out quite well! So why not join in the challenge and you could be getting an adorable digi like this each month! I love your dotted background!! !